It is apparently National Peanut Butter Day!! I am not a peanut butter fan but I'm sure many of you are so I thought I would find a peanut butter recipe to share with you all today. I found this recipe on Kraft Food. -PREPARE and bake brownies in 13x9-inch pan as directed on package; cool. Meanwhile, beat milk and pudding mix with whisk 2 min. Add peanut butter and sugar; mix well. Refrigerate until brownies are completely cooled. -MICROWAVE COOL WHIP and chocolate on HIGH 1 min., stirring every 30 sec. Spread over pudding; top with nuts. Refrigerate 1 hour. Make your brownies stand out even more at the party by making them in a CORNINGWARE® etch™ Baking Dish. Its artisan-quality design has a ribbon-like weave and colorful finish that give a modern touch to favorite desserts. Prepare using JELL-O White Chocolate Flavor Instant Pudding. Whaaaat? National Peanut Butter Day? I am so happy to hear there is such a thing. Thanks for spreading the word. And the treats look delicious, Allison. Yum! 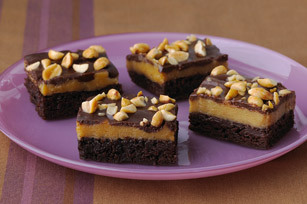 Peanut butter and chocolate is always a winner in my book. Thanks for sharing.